25 years ago...I can't believe it. OK, just add this to the list of recent posts that make me realize how old I really am! Target finally had my blue Ihome Ipod clock radio in stock. I brought it home and placed in on the shelf in my stamping room. After dinner, I spent some time in my stamping room and turned the Ipod on "shuffle." Listening to the various artists made me realize how diverse my musical taste really is. I enjoyed songs by Captain & Tennille (of course), Aerosmith, Don Henley, Chris Daughtry (the boy was robbed), Stevie Nicks, Nelly and Glenn Miller, just to name a few. I decided to limit the songs to only one per artist or else the entire top 10 would have been Captain & Tennille...hee hee hee. I guess you can see that I'm partial to songs of the 70's. There are quite a few current songs I enjoy, however, I doubt they will be in my "favorites" rotation a few years from now. We ate (and drank) at Trailhead Brewing tonight. My two favorite regular brews are the Trailhead Red Ale and the Missouri Nut Brown Ale. Their current seasonal is the Winter Lager which I enjoyed immensely. After dinner, we went to the Ameristar Casino. We are not big gamblers...$20 each and we're done! I'd rather spend money on good food, microbrews and or wine (or stamping supplies). After the brief gambling session, we stopped by the Bottleneck Blues Bar to see Dr. Zhivegas, a local 70's cover band. They sang one of my favorite disco songs...Le Freak. I had the 45 (those of you under the age of 35 probably don't even know what this is) and I would play it non-stop at a rather high volume until my mom told me to turn it down...hee hee hee. It's supposed to be really cold tomorrow with the chance of rain, freezing rain or snow. Yuck. Hurry up Spring! When I was a kid, I loved buying Tiger Beat, 16, and all of the other "teen" magazines whenever there was an article on my favorite performers, Captain and Tennille. I still have a scrapbook of the articles and pictures I collected over the years. I actually take it out of the closet every once in a while and look through it. 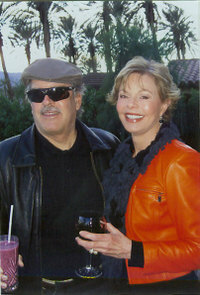 Toni & Daryl posted this new photo of themselves on their web page. The photo was taken on 12/27/06. The ever health conscious Daryl is drinking a blueberry smoothie while Toni enjoys a glass of red wine. I would choose the wine over the smoothie so I guess that's something on which Toni & I agree. One thing on which we don't agree is politics. Toni is a registered Democrat. Can you believe it? Oh my goodness! I had actually known this for some time because I knew that she supported Kerry in the last election but she confirmed it on her blog a few weeks ago. She also mentioned that Daryl is a registered Republican...yeah, Daryl! Oh well, maybe Daryl can talk some sense into her before the next election...hee hee hee. OK, I finally took pictures of the three ATC's I made for recent swaps. 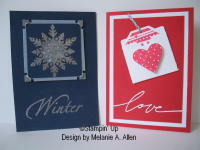 This first one was created using one of the new Stampin' Up Sellabration sets called So Very. It was somewhat difficult to come up with a design to incorporate as many of the words from the set as possible. Although it turned out ok, it's not one of my favorite creations. I really like these two ATC's. The first one is for the January swap which is entitled "Sparkle, Glitter and Shine." This was inspired by the Christmas card I made for my niece, Amanda. The second one is for the February swap entitled "Love & Hearts." I used my new library pocket punch to hold the little tag. I considered using different colors but then finally decided to use traditional valentine colors. I had intended to post an entry this past weekend but I never got around to it. Friday night, Bill and I ate dinner at Morgan Street Brewery. They currently have a special beer called Decades in celebration of their 10th anniversary. I had it last time we were there too! Saturday night, we ate at Frederico's with my parents, sister, brother-in-law and the kids. The food was wonderful...delicious arancini and the best chicken spedini I've ever eaten! I-Indulgence: a large Stampin' Up order just for me! J-January or February: February because that means spring is that much closer! T-Tag 3 or 4 people: Julia, Shell. and Concetta. W-Worst Habit: Smoking...oh, silly me, I don't smoke! Hee hee hee...I guess I don't have any bad habits! Y-Your fave food: I consider myself a foodie and really enjoy a lot of different foods...too many to narrow down to one or two. I chose Pink Passion as the main color and Gable Green as the accent color. 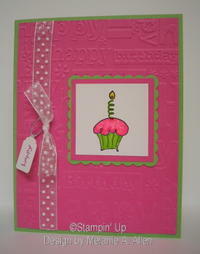 I embossed the background with the Cuttlebug Happy Birthday embossing folder. The focal image is the cupcake from the Birthday Best set. It was stamped on white and then layered on a slightly larger piece of pink and a scalloped green piece that was created using the Marvy Uchida Giga Scallop punch. Dazzling Diamonds was applied to the icing and the candle flame. I added the polka-dot ribbon and a small tag secured with silver cord to complete the design. The "experts" are predicting another winter storm Saturday and Sunday but it's supposed to be snow this time. I sure hope the power stays on! It was announced yesterday that the 2009 All-Star Game will be here in St. Louis. It's about time! The last time it was held in St. Louis was 1966 and I don't remember it because I was only 4 at the time. Yes, that is me in 1966. Wow, that was a long time ago! I wonder if the new stadium and the World Series win had anything to do with the decision. Regardless of the reason, I'm glad they chose St. Louis. 43 years between All-Star Games is much much much too long! The coating of ice really is pretty. Of course, I probably wouldn't be saying that if our power was still out. 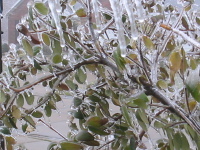 Another ice storm was supposed to move through the area today but the temperature hovered at around 36 degrees so all of the precipitation fell in the form of rain. I'm definitely not complaining! 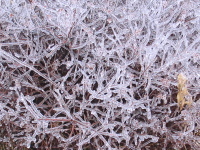 This is a photo of one of our bushes in the front yard. The ice is almost 1/2 inch thick. Luckily it coated only the trees and bushes but the streets, other than the overpasses and bridges, are clear. Unfortunately, it also coated the power lines which is why some people are still without power. I'm once again reminded why I don't like winter...cold, ice snow, yuck! Even though it has been known to snow in March, and pretty heavily to boot, I jump for joy once we get through February because I know that spring is just around the corner. Maybe we'll be lucky and this will be the last storm of the winter. A girl can hope, right?! The cold and ice inspired me to create a card with a "warm" feeling. What's better than hot chocolate on a cold winter's day! I used my new Like it a Latte set. I don't drink coffee so this is not a latte...it's a steaming cup of hot chocolate with whipped cream on top. It looks good enough to drink! It's supposed to be super cold this week. We've been lucky so far so I guess I shouldn't complain. I'll just keep my sights on Spring and hope for the best. I hate winter. I hate winter. Let me say it one more time...I HATE WINTER. I hate snow, ice, cold...I hate the fact that it gets dark so early. I need to move to a warmer climate. Hmmm, I think Hawaii would be a nice place to live. 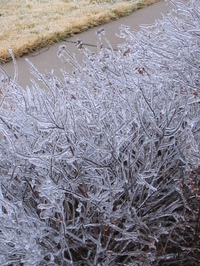 We had another ice storm last night and they are predicting more ice overnight tonight and even more tomorrow. We lost power at around 4:30 am this morning. Fortunately, it came back on at around noon. It was 57 degrees in the house when the electric finally came back on and, by the time it was 63 degrees about an hour later, it felt absolutely tropical in here! It's amazing how much difference 6 degrees makes. When it finally reached 68 degrees, I was ready to break out the shorts. There are still about 100,000 people without power in the St. Louis area. I feel their pain and am hoping that their power is restored quickly. A few months ago, I became aware of a really cute website called Stuff On My Cat. It's even listed under my "Favorite Sites" on the left panel of this blog. Some of the pictures are absolutely hilarious. Even people who aren't cat lovers (are there really any such people) will get a kick out of this site. This is a picture of Greta that I used for the logo on the back of our Christmas cards this year. Yes, that is really Greta and yes, she really sat still for the picture. The secret to getting a picture like this is to wait until your kitty is asleep and then put the ears on her...hee hee hee. She woke up and gave me a look as if to say "What the heck are your doing and get these things off of me!" I submitted this picture to Stuff On My Cat for possible posting on their website. If they choose this picture, I'll be sure to let you know. Keep your fingers crossed!